I have to admit, I thought long and hard about what to write today. After all, there are just so many things to say about our Blessed Mother. I went back and read one of my older posts on proof the Assumption happened. I thought about Her amazing faith in our Father. I pondered how she found the strength to watch her Son go through what He did for us. I wondered what it was like on that glorious day. 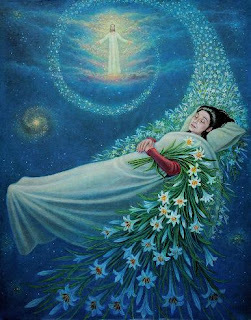 Most of the time when I think about the Assumption I think of the physical raising of Mary's body into Heaven. What was that really like? Was she carried away by angels? Did she float up on a cloud? Did it happen during the day or at night? But Happy to Be Catholic gave me a whole new perspective in her comments on my last post. She noted how wonderful it must have been for Mary to meet our Father for the first time! I have to admit, I never thought about it like that! Mary is such an important figure in our faith that sometimes I forget she only met God after her time here on Earth. HC also stated how happy Mary must have been to see her Son again! Again, I had never really looked at the Assumption through Mary's eyes. Of course she must have been overwhelmed with joy be reunited with Jesus after all the suffering they went through here on Earth. 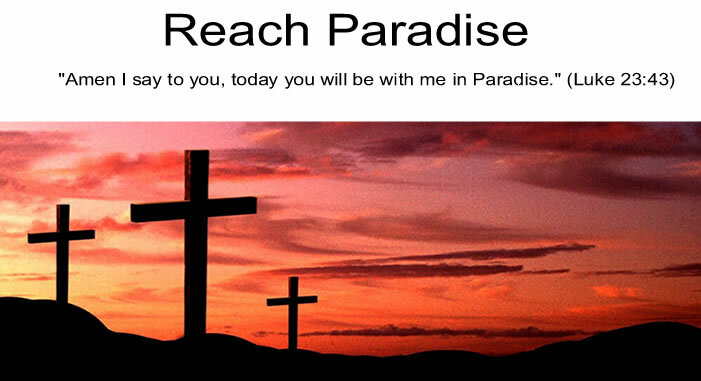 And of course, everyone in Heaven must have rejoiced to finally have Mary join them in Paradise. What a beautiful day it must have been. Michael, you are really wonderful. I pray this feast of the Assumption is especially blessed for you. I found a special payer for today that I think you might like, it gave me even more to ponder about today. It is in my post on the Assumption. You probably already know but in case you hadn’t seen it - a worldwide rosary is being prayed tomorrow in honor of the Assumption. Info at the end of my post. May God bless you always! I love the Feast of the Assumption too Michael!! Just like on Easter Sunday I imagine the sweet reunion between Mary and Jesus and it brings tears to my eyes! I can see her running to Him; there is no more happy sight for me to envision except -- me getting to do the same thing ... someday. God bless you for this beautiful, uplifting reflection! You gave us a lot of nice things to ponder about the Blessed Virgin Mary. Some of those things you have mentioned have come to mind when I pray the Glorious Mysteries of the Holy Rosary. I also think about the Assumption when she was reunited with Jesus, the moment when Mary must have reached out to Jesus and touched Him again. Nice post. This is really lovely. I so enjoy reading how others relate to the saints. Thanks so much for sharing it. I love this post Michael. I find it so inspirational. It must have been glorious for Mary. Such joy after so much suffering here on earth.